The above register of Licenses granted by Chelmsford County Court shows the transfer of the pub license. 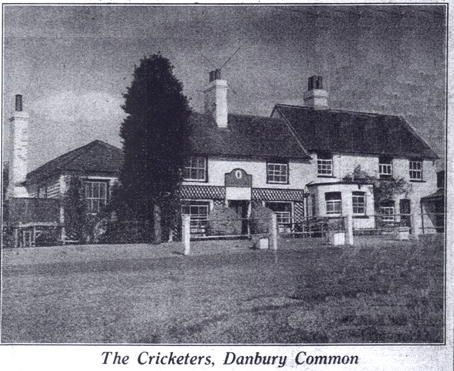 On the seventh of March 1884 the License of The Cricketers Danbury tranfered from James Reeve to George Musgrove. 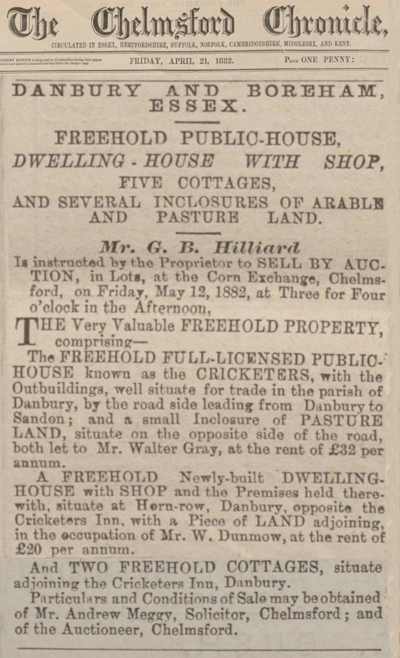 The advert (right) shows an auction in 1882 for both The Cricketers and The Bakery directly across the road which was occupied by William Dunmow. William Dunmow summond George Musgrove in the County Court in November 1886 for nonpayment of goods supplied. The Musgrove remained here until the Langman's took over in 1886. An interesting note is that the Musgrove's moved back to Danbury in 1891 and lived in William Dunmow's former bakery which was now named The Lodge.